The Clarinetquest repair shop has a single-minded focus, make every instrument play to the top of its potential. Regardless of whether we are fine tuning the set up on a new clarinet or restoring a vintage one, working on a student’s instrument or restoring a top professional’s; our focus never wavers. When it comes to repair, our motto is there are simply NO Short-Cuts! Firmly anchored in the tradition of old-school repair philosophy, Clarinetquest passes on the knowledge from master-craftsperson to apprentice. Every repair is a team effort with each repair job being approved by multiple techs and players before going out. Every repair person at Clarinetquest lives for a new challenge, relishes in every opportunity to learn something new and constantly explores fresh and improved repair methods. Clarinetquest is an affiliate of Saxquest and is located in St. Louis, MO and we are happy to accept long distance repairs. The Clarinetquest repair shop is the core of our business. Everything else from sales to customer service is built up from the shop. Our shop exemplifies the passion we have for our mission, as stated above, and is fueled by our desire to strive for perfection. 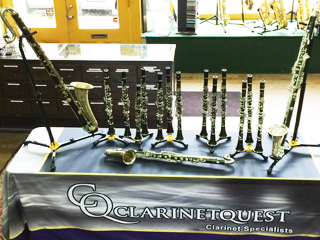 The Clarinetquest repair shop employs 6 repair experts with over 70 years combined experience. Having a repair team with diverse knowledge and vast experience gives us the opportunity to freely float ideas and learn from each other. This is a huge advantage we have over smaller one man shops. We enjoy preserving the art of musical instrument repair in our workshop by passing the knowledge on in the old-world tradition of master crafts-person to apprentice. Each artisan at Clarinetquest maintains an uncompromising dedication to the highest level of and skill and craftsmanship. It's holding fast to this core value more than anything else that has put our on the map as one of the premiere full-line musical instrument repair shops in the United States. In order to be remarkable at clarinet repair, one must posses’ skill in both woodworking and metalworking. One must also command exquisite sensitivity and touch in order to feel the difference between a good verses a GREAT set up. Further, an understanding of acoustics is a must. Clarinetquest is grateful to have on staff, orchestral and solo clarinetist, Audrey Denny as our Clarinet Specialist. She not only has that exquisite touch with her own instrument but she can also channel that sensitivity when setting up an instrument personalized to an individual’s specifications. Having performed at the highest levels with such esteemed ensembles as the Chicago Symphony Orchestra, Audrey knows firsthand how a professional clarinet should sound and feel. We’re also blessed to have on staff, Straubinger certified repair tech, Chris Funck. In repairing a cracked or broken wood clarinet, Chris is the master. There are a many different techniques and methods that can be employed with lightly or severely damaged instruments. At Saxquest our artisans know this and always use the best, least invasive approach when fixing your clarinet. We’re very fortunate to have as customers several diverse artists who perform at the highest levels in both top tier symphony orchestras and in jazz groups across the USA and the world.